As the chilly nights get colder, the perfect way to unwind and comfort yourself is a warm bowl of chili. If you are like myself, you prefer minimal mess and work while preparing a dish. That’s why combining the cornbread and chili into one dish is amazing. It saves you time, energy, and dishes! 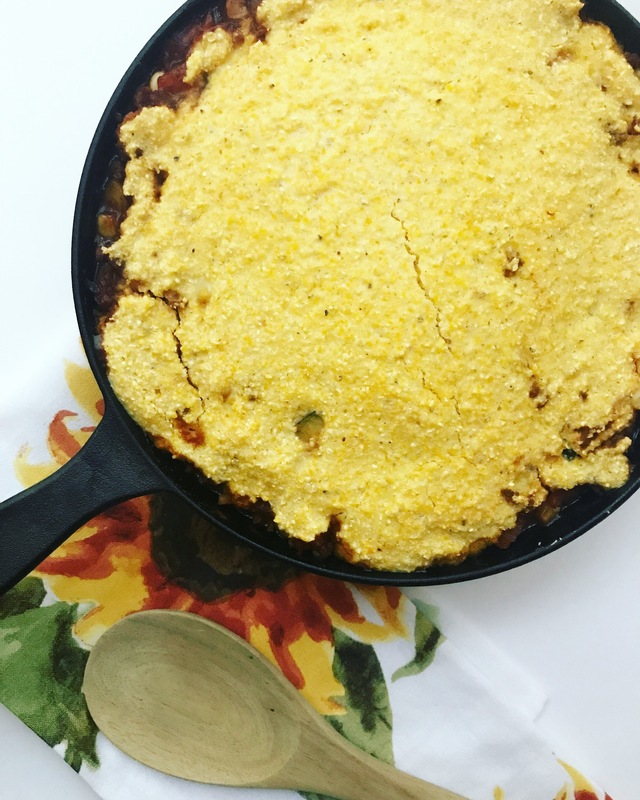 Rather than letting the chili cook, and then preparing the cornbread, you do the two steps in one, and the turn out is so tasty. Step 1: Preheat the oven to 400 degrees. Step 2: Warm up your skillet (or instant pot to sauté) and begin cooking the crumbles, pepper, and onion. As the crumbles starts to brown, add in the remaining chili ingredients. Once all the ingredients are cooked through (crumbles browned, onions translucent, peppers soft, etc) transfer mixture to a skillet. Step 3: As this cooks, prepare your flax egg on the side. Step 4: Prepare your cornbread and baking powder in a medium sixe bowl. Whisk until well combined. Step 5: Whisk together the flax egg, vegan butter, vegan milk, and sugar. When well-combined, add to cornmeal mixture, and stir well. Step 6: Transfer the cornbread mixture to the top of your chili skillet. Spread over the top of the chili, until evenly coated. Step 7: Bake for 15-20 minutes. The cornbread should be crispy on the sides, and cooked all the way through. Follow the same steps as above with your Paleo ingredients! Hi Laura, I’m so sorry you never heard from me. I don’t remember receiving a message so that’s why I never contacted back. A collab sounds great! I’d love to 😊I’ll be sure to checkout your blog. Thanks for reaching out!